Two duos, four musicians that have worked together on an array of different projects, expect a night of tune swapping, story telling and one-off musical moments! Eilidh Shaw and Ross Martin are probably best known for their work with two top traditional bands; Eilidh with The Poozies and Ross with Daimh, although some may recall the early 2000s when they made up two fifths of the cult folk explosion that was Harem Scarem. Between them they have been at the heart of the Scottish Music scene over the last 20 years and have toured the world both with their own groups and performing as guest artists with a vast array of top performers, clocking up over 100 album appearances with names as diverse as Gaelic Superstar Julie Fowlis, Alt-Country legend Bonnie Prince Billy, Classic Crooner Tony Christie and World Music/ Jazz Fusion impresario Arnaud Ciapolino. 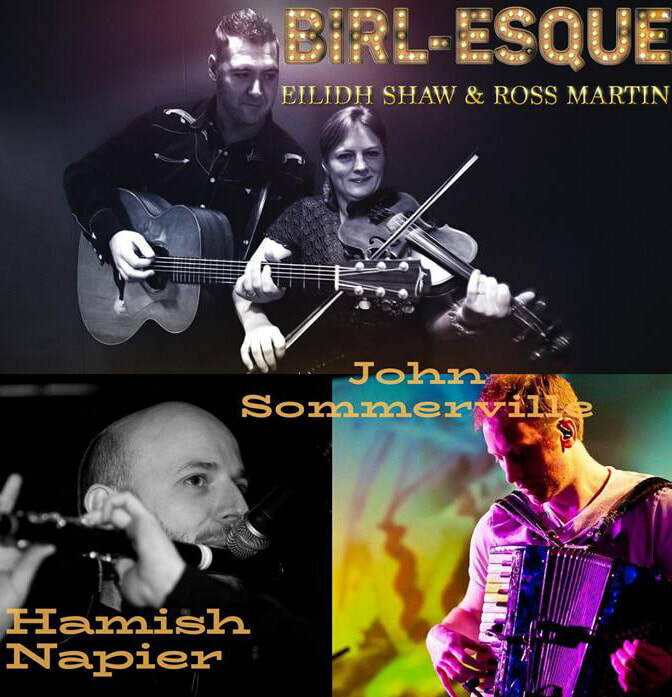 Two thirds of the Cask Strength Ceilidh Band, John Sommerville (accordion) and Hamish Napier (piano and flute), are world renowned musicians and composers. Both have been at the forefront of the incredible traditional music scene in Glasgow for the last 20 years and are in constant demand as both session musicians and tutors although they are best known for their work with such bands as The Treacherous Orchestra, Croft No.5, Back of the Moon, Duncan Chisholm and many, many more.